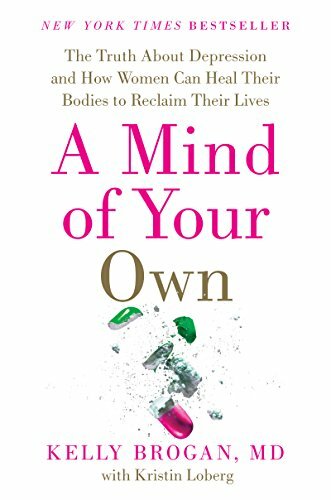 I feel compelled to feature an excellent article by renowned holistic psychiatrist Dr. Kelly Brogan, author of NY Times best seller 'A Mind Of Your Own', a dear friend and trusted colleague I can vouch for personally and support whole heartedly. It's about something that touches just about all of us, and me deeply as a woman, mother and midwife who cares for them. It took my own illness postpartum after my fourth baby and the subsequent failure of western medicine to cure it, let alone treat it risking terrible side effects, for me to do years of research on alternative natural modalities and find complete healing, and to understand and best help the countless expecting and postpartum women who seek my help to heal their suffering. It took a tragedy I witnessed with a baby girl who, after a beautiful normal birth and fetal heart rate, was unable to transition to life outside the womb despite the best of efforts and tragically died in the NICU, for me to become most passionate about this topic; the autopsy report said the death was caused from fetal exposure to a common medication to treat mama's depression prior to and during her pregnancy, prescribed by her psychiatrist and approved by the perinatologist for her to take while pregnant and proceed with a homebirth, as she was not interested in other holistic modalities. A year later the autopsy report was amended and all mention of the woman's depression and the medication she was taking was completely removed not only from the report, but from the hospital chart. I was mortified. I shared the case with other colleagues and physicians, and with a leading midwife in one of our organizations that collects the data and outcome stats of midwives around the world, which continuously documents the safety of homebirth midwifery care; she was shaking as she told me the same events were reported by midwives in other states - she had just reviewed a case two weeks prior. The physicians I spoke with casually brushed it off; they suggested when the case was reported to the pharmaceutical company per protocol, there was probably some financial incentive given by them to the hospital to amend the record. No one was interested in or could afford pursing this any further. I never really comprehended the power and corruption in the health care industry. When I talk about medicine and mental health to large audiences, I often start with the following imagery and facts: think of a woman you know who is radiantly healthy. I bet your intuition tells you she sleeps and eats well, finds purpose in her life, is active and fit, and finds time to relax and enjoy the company of others. I doubt you envision her waking up to prescription bottles, buoying her way through the day with caffeine and sugar, feeling anxious and isolated, and drinking herself to sleep at night. All of us have an intuitive sense of what health is, but many of us have lost the roadmap to optimal health, especially the kind of health that springs forth when we simply clear a path for it. The fact that one in four American women in the prime of their life is dispensed medication for a mental health condition represents a national crisis. Humans have used mind-altering substances to try to dull and deaden pain, misery, sorrow, and suffering since time immemorial, but only in the last few decades have people been persuaded that depression is a disease and that chemical antidepressants are the remedy. This is far from the truth. Many of my patients have been to multiple doctors, bumping up against the hard ceiling of what conventional medicine has to offer. Some have even tried integrative medicine, which aims to combine both traditional medicine (i.e., prescriptions) with alternative treatments (e.g., acupuncture). After all, they are told that there are great natural complements to all the wonders pharmaceutical products have to offer. But the reason they can’t find a solution is because nobody has asked why. Why are they unwell? Why are their bodies creating symptoms that manifest as depression? Why didn’t they stop to ask this important and obvious question the first time they experienced a flat mood, anxiety, insomnia, and chronic exhaustion? Before I even get to the answers, let me be the first to tell you that the only path to a real solution is to leave the medical world you know behind. This, the journey I will take you on, is not just about symptom suppression, it’s about health freedom. First let me tell you that I was once a typical doctor, not to mention a typical American who loved pizza, soda, birth control, and ibuprofen. My message is from a personal journey and thousands of hours of research that has compelled me to share the truth about prescription-based care: we’ve been duped. Fear is an appropriate response to symptoms. We need chemicals to feel better. Doctors know what they are doing. The body is a machine requiring calibration (via drugs). A little too much of this, too little of that. I call this collective set of notions the Western Medical Illusion. It sets up a vicious system that ushers you into lifelong customer status, dependent and disempowered. Medication treatment comes at a steep cost. Optimal health is not possible through medication. Your health is under your control. Working with lifestyle medicine—simple everyday habits that don’t entail drugs—is a safe and effective way to send the body a signal of safety. In holistic medicine, there are no specialties. It’s all connected. I am a practicing psychiatrist with a degree in cognitive neuroscience from MIT, an MD from Weill Cornell Medical College, and clinical training from NYU School of Medicine, and I care deeply for women struggling with their well-being. I’m compelled to share what I’ve learned about the corruption of modern psychiatry and its sordid history while investigating holistic methods that focus on nutrition, meditation, and physical activity—what some practitioners are calling lifestyle medicine because the approach involves changes in everyday lifestyle habits, not the use of pharmaceuticals. While such drug-free methods are entirely evidence-based, they are virtually unknown in this age of the quick fix. For my patients to be well, I know they will need to approach their health with an extreme commitment to the integrity of their mind and body. Because we are looking at the body as an intricately woven spiderweb—when you yank one area of it, the whole thing moves. And because there is a more powerful way to heal. It’s so simple that it could be considered an act of rebellion. Depression is an opportunity. It is a sign for us to stop and figure out what’s causing our imbalance. Rather than symptoms as a sign that you are broken and weak, born this way, and condemned to a struggle with low serotonin—simple, powerful changes can begin to send the body a signal of safety, and then free the mind. When the body and its interconnected systems is healed, symptoms resolve and the mind is no longer the enemy but a trustworthy tool for transformation. Basic lifestyle interventions can facilitate the body’s powerful self-healing mechanisms to end depression: dietary modifications (more healthy fats and less sugar, dairy, and gluten); dietary modifications (more healthy fats and less sugar, dairy, and gluten); natural supplements like B vitamins and probiotics that don’t require a prescription and can even be delivered through certain foods; minimizing exposures to biology-disrupting toxicants like fluoride in tap water, chemicals in common drugs like Tylenol and statins, and fragrances in cosmetics; harnessing the power of sufficient sleep and physical movement; and behavioral techniques aimed at promoting the relaxation response. I’ve seen women transformed in a little as 30 days. Dare to be one of them! Learn the tools you’ll need in A Mind of Your Own. Kelly Brogan, MD, is a Manhattan-based holistic women’s health psychiatrist, author of the book, A Mind of Your Own, and co-editor of the landmark textbook, Integrative Therapies for Depression. She completed her psychiatric training and fellowship at NYU Medical Center after graduating from Cornell University Medical College, and has a B.S. from MIT in Systems Neuroscience. She is board certified in psychiatry, psychosomatic medicine, and integrative holistic medicine, and is specialized in a root-cause resolution approach to psychiatric syndromes and symptoms. She is a mother of two. Depression has become an epidemic in which psychiatrists commonly make a diagnosis label and quickly write a prescription. Depression effects 1 in 4 women of reproductive age, and anxiety and stress induced illnesses are rampant. Dr. Brogan's course is a must. I recommend it to professionals who serve women so they can best help them or themselves, and I recommend it to all those who seek my guidance. I feel it is especially critical to help pregnant and breastfeeding women prevent and effectively treat these mental illnesses naturally, as the medications not only impact mama but can seriously impact baby; these effects are real, I have witnessed them, yet they are downplayed by the medical community and pharmaceutical companies. I am passionate about dis-ease prevention, helping people heal their suffering and live in joy, and changing lives. Her 44-day course is changing thousands of lives. Vital Mind Reset is a program that will hold your hand and help you heal your life without a prescription. It will also introduce you to a community of people just like you – all working to transform their lives and revive their power and joy. Be a part of this community. Be a part of something greater and get yourself back! DOWNLOAD Dr Kelly Brogan's FREE E-BOOK: Change Your Food, Heal Your Mood and discover 3 simple steps to a healthier body and a healthier brain — without psychiatric drugs!